5'1 is the new 6'2: BRING IT ON - HOBBIES! BRING IT ON - HOBBIES! 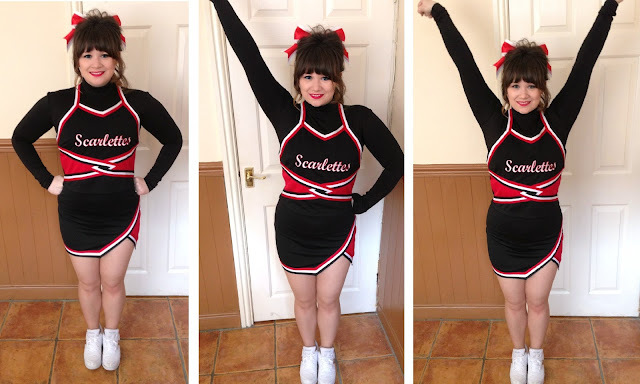 Cheerleading is basically what I do for a hobby besides blogging - which we don't seem to mention much on blogs... So I thought I would! Doing a few standard cheer poses! I'd never really done cheer before uni - more just gym and dance and I've always been pretty flexible - but when I joined my uni I've LOVED it - well until I fractured my ankle at comp and can't now compete till next year! (Urgh I'm accident prone!) I love cheerleading, but I hate the fact everyone thinks we run round with pom-pom's like idiots at football games; which we do some times - But we are hard-core athletes. We compete in competitions like FuterCheer, BCA and Nationals and compete at different levels. I only compete at level 1 and 2 - But I have a friend who competes at level 3 ad 4 - then 5/6 is where it get's super cringey to watch! It's helped me teach myself to be more flexible again after an accident meaning I can get back into the splits and show off my funny bending leg in a heel stretch! Heel Stretches and the Splits! - and yes my leg does bend on a funny angle! But as it is a kind of #OOTD post I won't skip on talking about how cute this outfit is! Though the skirt is rather short and the compay over estimated my 34FF's as the top's a wee bit big! But you can't expect perfection! The classic look is always the standard over top and skirt with your Under-Armour (A fancy word for a top and a pair of black spanx!) underneath. Add a pair of white trainers and a bow to top it all off - and obviously a splash of bright red lippy (I'm wearing MAC: Lady in Red -it's amazing you MUST try it!) and I end up looking like one of Barbie's lil sister's and like a Staffordshire Scarlette! But it's fun and I love it! So that's a wee brief on a lil hobby and me showing off a few moves - as I love to do! Tell me what you think and if any of you Cheer, Dance or generally if you just have other Hobbies besides blogging - I'd love to know! I was a cheerleader in highschool and loved it! you look so cute!! Thats so cool! I always wanted to get into cheerleading but sadly I have the coordination and flexibility of hippo. And that outfit is so cute! Definitely suits you! Ahh so lovely to meet another blogger who cheers :D i cheer with my University! Aw, you're so adorable in this outfit :) always admired cheerleading, but it's not so known in my country. Make sure you don't bend your wrists in a high V (big deduction) and your lower leg should NEVER be bent in a heel stretch. Defying Gravity: Glinda Oz Urban Decay!